Novodevichy Cemetery (Russian: Новоде́вичье кла́дбище, Novodevichye kladbishche) is the most famous cemetery in Moscow. It lies next to the southern wall of the 16th-century Novodevichy Convent, which is the city's third most popular tourist site. It should not be confused with the Novodevichy Cemetery in Saint Petersburg. The cemetery was designed by Ivan Mashkov and inaugurated in 1898. Its importance dates from the 1930s, when the necropoleis of the medieval Muscovite monasteries (Simonov, Danilov, Donskoy) were scheduled for demolition. Only the Donskoy survived the Joseph Stalin era relatively intact. The remains of many famous Russians buried in other abbeys, such as Nikolai Gogol and Sergey Aksakov, were disintered and reburied at the Novodevichy. A 19th-century necropolis within the walls of the Novodevichy convent, which contained the graves of about 2000 Russian noblemen and university professors, also underwent reconstruction. The vast majority of graves were destroyed. It was at that time that the remains of Anton Chekhov were moved outside the monastery walls. 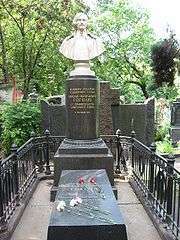 His grave served as the kernel of the so-called "cherry orchard" - a section of the cemetery which contains the graves of Constantin Stanislavski and the leading actors of his company. 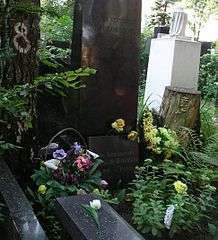 Under Soviet rule, burial in the Novodevichy Cemetery was second in prestige only to burial in the Kremlin Wall Necropolis. Among the Soviet leaders, only Nikita Khrushchev was buried at the Novodevichy rather than at the Red Square. Since the fall of the Soviet Union, the Kremlin Wall is no longer used for burials and the Novodevichy Cemetery is used for only the most symbolically significant burials. 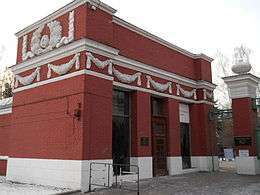 For example, in April 2007, within one week both the first President of the Russian Federation Boris Yeltsin and world-renowned cellist Mstislav Rostropovich were buried there. 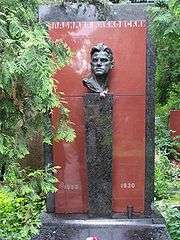 Today, the cemetery holds the tombs of Russian authors, musicians, playwrights, and poets, as well as famous actors, political leaders, and scientists. More than 27,000 are buried at Novodevichy. There is scant space for more burials. A new national cemetery is under construction in Mytishchi north of Moscow. The cemetery has a park-like ambiance, dotted with small chapels and large sculpted monuments. It is divided into the old (Divisions 1-4), new (Divisions 5-8) and newest (Divisions 9-11) sections; maps are available at the cemetery office. Wikimedia Commons has media related to Novodevichy cemetery (Moscow). ↑ Vorhees, Mara; Ryan Ver Berkmoes (2003). Lonely Planet Moscow. Lonely Planet. p. 256. ISBN 1864503599. ↑ Roskies, David G. (1999). The Jewish search for a usable past. Indiana University Press. p. 217. ISBN 0253335051, ISBN 978-0-253-33505-0. ↑ Brooke, Caroline (2006). Moscow: a cultural history. Oxford University Press. p. 268. ISBN 0195309529, ISBN 978-0-19-530952-2. ↑ Gilbert, Hillary (2009). Frommer's Moscow Day by Day. Frommer's. p. 192. ISBN 0470723041, ISBN 978-0-470-72304-3.